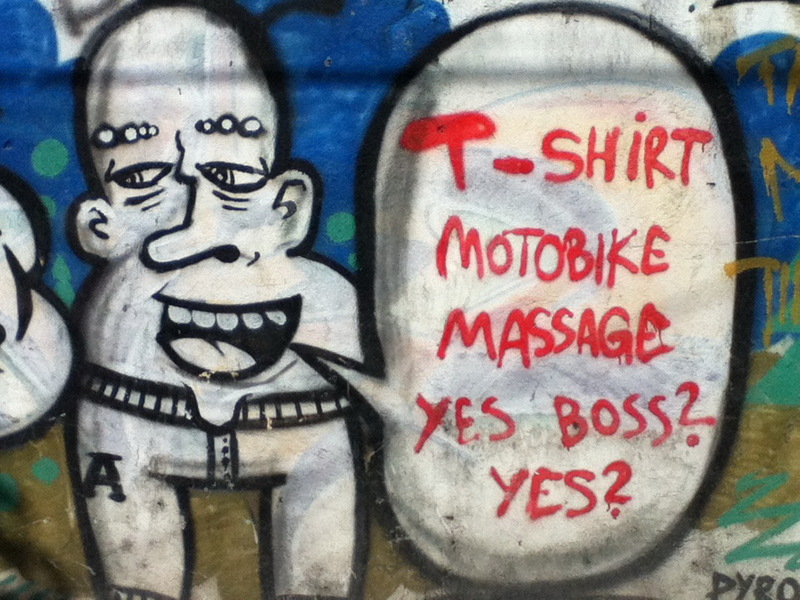 You could be getting a massage on a motorbike while wearing 11 t-shirts and someone in Kuta would still ask if you needed any of these things. 1. Traffic is brutal in and around Kuta and Denpasar and it sounds like it is only getting worse. With the rapid growth in tourism over the past few years, there was naturally a corresponding increase in the number of cars, vans and motorbikes on the roads as those tourists required transport. But those tourists brought more than just their own transportation needs. They also brought money and thus an increase in the standard of living for locals, an increase which resulted in the appearance of many a new motorbike on the roads. Unfortunately, it seems that the government has thus far been unable to address that increase with the necessary road expansion, not to mention other necessary public works projects such as sewage treatment. Kuta seemed to be total gridlock when I was there but one of my drivers assured me that it wasn’t that bad (all while we weren’t moving at all en route to the Bukit Peninsula and scooters were taking to the sidewalks to avoid the logjam) and that I should see it during high season which tends to be during July, August and December. No thanks. 2. The food was decent and, in fact, I became a big fan of the nasi goreng (fried rice served with a fried egg on top and a sidecar of shrimp crackers) particularly for breakfast. Good smoothies too. But I suspect Balinese food will pale in comparison to several other cuisines that I’ll be fortunate enough to rock on this trip e.g. Thai, Vietnamese and Indian. 3. 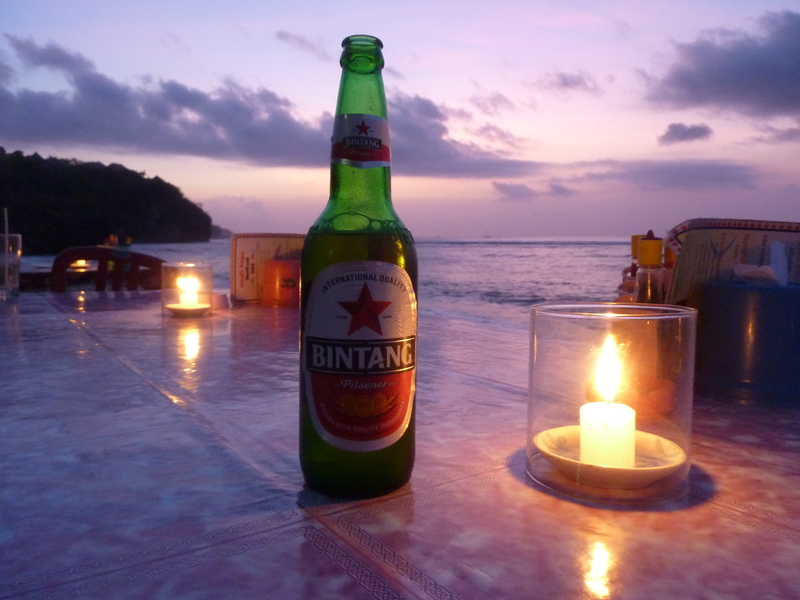 Bintang is a very solid contender for best surf trip/island beer and may in fact edge out several of the Mexican beers that have long held the top spots in my rankings. 4. I skipped Ubud as I was feeling really down on touristy things at the point in my stay on the island when a visit would have made sense. It sounds to me as if this formerly sleepy little treasure of an artistic town in the mountains has been inundated with vacationers (often with yoga mats in tow) ever since the publication of Eat, Pray, Love (which James tells me is his favorite book of all time). Several friends and acquaintances were of the opinion that I wouldn’t be missing much if I skipped it. I suspect that it was the right call for my particular trip but part of me wonders if I should have at least given it a day or two. 5. The Balinese are quick to smile and I hope that’s something that I learned to do as well. 6. While it was an ideal spot from which to kick off a long tour of South and Southeast Asia with a month of surf, and while I had a fantastic time there with many a tasty wave credited to my account, I probably wouldn’t choose to go back to Bali solely for a surf trip. True the waves are very good and the swell seems to be amazingly consistent and the price is right once you’re there. But when I leave LA for a surf trip, objective #1 is always uncrowded, quality surf and I don’t know that that’s possible in Bali nowadays without some extensive local knowledge of off the radar spots. Furthermore, it’s a very long trip from LA and thus tough to justify when Mexico and Central America are so much closer and offer less crowded surf in my experience. It’s also nice to leave traffic issues behind when venturing forth from LA. Another strike, at least for me, is that some of the waves are actually too classy, or, in other words, too critical. Pulling into racy lefthand barrels over shallow, sharp coral is not really something I need to be trying to pull off at this point in my life unless full body armor were an option. That being said, I could certainly see myself returning to Bali to use it as the jumping off point for a surf trip to explore other islands in Indonesia, particularly if I could assemble a large enough surf gang such that booking our own boat trip were feasible. So who’s in? 7. I love the attention paid by the Balinese to their living environment from architecture to interior design to landscaping. It’s a beautiful country, partly by nature, but partly due to the hands of the Balinese. 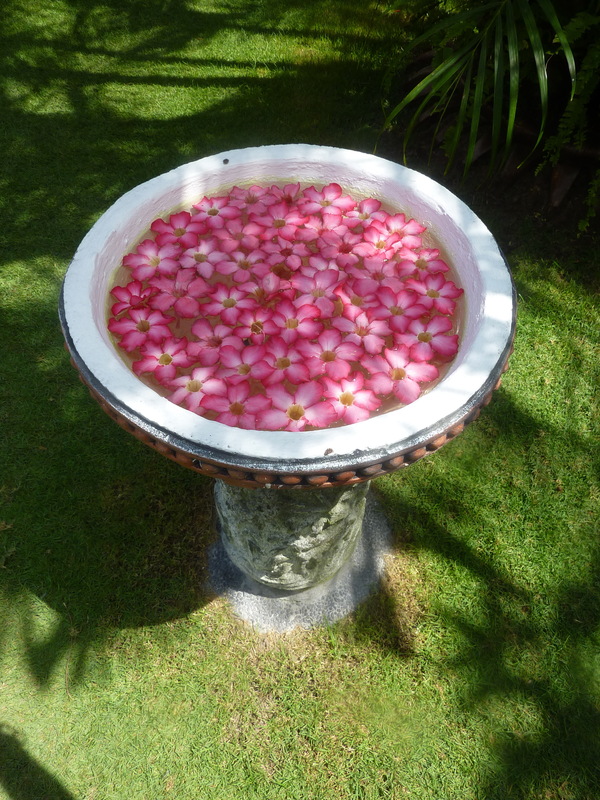 Someone took the time to do this with fresh flower petals each morning at the Masa Inn which was by no means a fancy hotel. Awesome. And yes, those are actual fish tanks. Selamat tinggal, Bali! 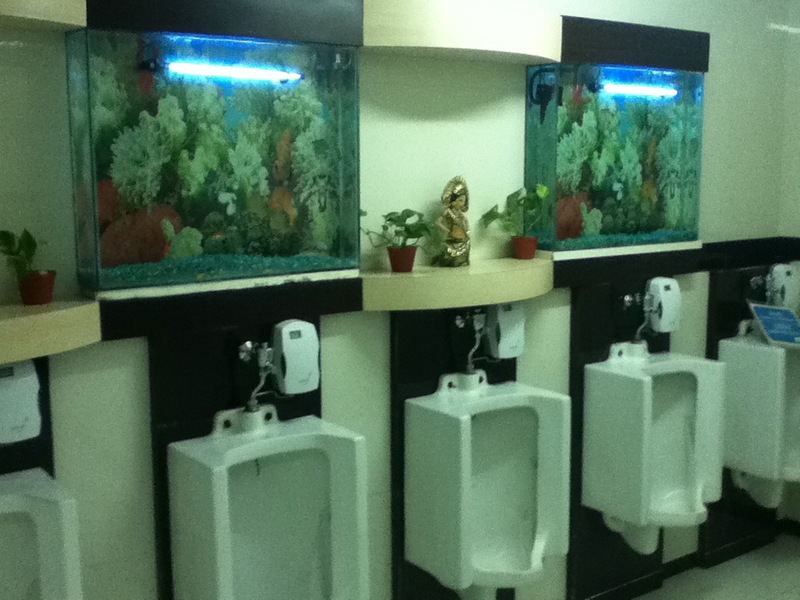 I hope your Paruresis was not triggered by those fish in the tanks watching you pee.